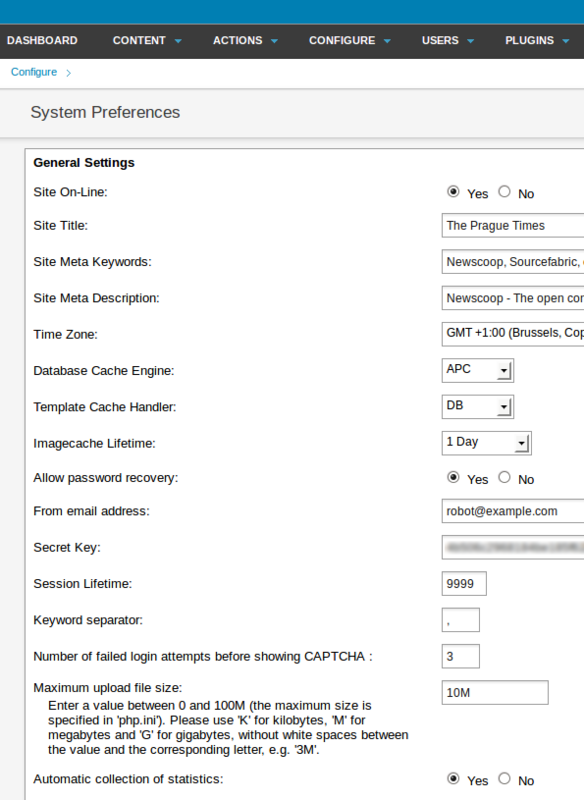 The System Preferences page is accessed via Configure in the main Newscoop navigation menu. This page allows you to control some advanced aspects of your Newscoop server, so it is recommended that access is reserved for administrators only. The first section of the System Preferences page is for General Settings. Site On-Line: These Yes and No radio buttons enable you to put the whole Newscoop server on-line or off-line, for example in case of scheduled server maintenance. Site Title: The default name for your publication's website. Your theme designer can configure your publication's templates to display this information. Site Meta Keywords: The default keyword meta tags in your header template, for search engine optimization. Site Meta Description: The default description meta tag in your header template, also for search engines. Time Zone: This field enables you to override the server's own time zone setting, which is typically set to Greenwich Mean Time (GMT) or UTC. You may wish for your Newscoop interface to display local time instead, for instance when scheduling publication time for a particular issue. Database Cache Engine: enables or disables the APC cache, which can improve Newscoop performance. APC is an alternative to xcache. Template Cache Handler: Select DB to enable the cache for templates. Imagecache lifetime: The time that images will be cached for, from 30 seconds to infinite. Allow password recovery: Whether users can get a password reminder by email. Note that if this feature is enabled and your email account is compromised, your Newscoop publication can easily be compromised in turn. From email address: The email address used for password reminders from the system. Secret Key: The security key that Newscoop can use for integration of web services and other advanced features. Session Lifetime: Enables you to specify the maximum duration of Newscoop administration sessions without re-authentication, which is a security feature. Keyword separator: Specify the separator for Keywords in the Edit Article page (comma or hyphen). Number of failed login attempts before showing CAPTCHA: A security measure designed to foil password-guessing robots. Maximum upload file size: The maximum size of attachments that users of your server can upload. Automatic collection of statistics: This option enables the collection of statistics on reader access to publications on the server. You may wish to click No if you use a third-party statistical service, as disabling the collection of statistics may reduce the load on your Newscoop server. This section of the page configures Newscoop to use your prefered mail server. SMTP Host: The server that Newscoop will use for sending out email notifications. SMTP Port: The port number that Newscoop will use on the specified email server. Email contact: The main contact email address for your Newscoop server. Email from: The email address used when sending notifications from Newscoop. The next section of the page is for Editor Settings, which refer to image handling. The fields in this section enable you to specify the default Image Resizing Ratio, or default width and height, for images inserted inline with article text. The resizing ratio takes precedence over any Resizing Width or Resizing Height value which is set here. If Ratio is not set but both Width and Height are set, then Newscoop will use the value which results in a smaller image size. The default settings here can be overridden by the ratio, width or height settings for a specific inline image set on the Article Edit page. Image sizes which are part of the publication templates, such as the main story image in an article template, are configured separately, via the Image Rendering page on the Configure menu. If the Zoom enabled for images in article content? radio button is set to Yes, readers can enlarge article images in your publication's pages by clicking on them. This zooming feature works for any images inserted inline with the article text. Set Enable rich text for image captions? to Yes if you would like captions in articles to have a WYSIWYG editor for formatting and links, or leave the default setting of No for plain text captions. If you enable this feature, the default limit for caption length is 255 characters. You can set zero here to have no limit on the length of captions, as long as your publication's theme design can accomodate any length of caption. This section of the page is related to external subscription management software. If you select the Yes radio button for the Reader subscriptions managed externally? option, the subscription management features in the Newscoop administration interface are hidden. The subscription data is still held in the Newscoop database, which your system administrator will have connected to your third-party subscription management software. This section enables you to set up Newscoop to operate on two servers at once, which is a safety feature in case of hardware or network problems. Database Replication Host: The name or IP address of the remote database server. 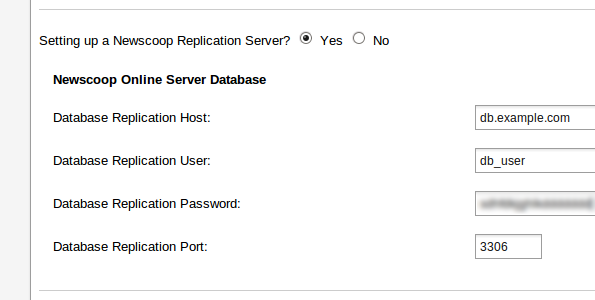 Database Replication User: The user name to connect with on the remote server. Database Replication Password: The password to submit on the remote server. Database Replication Port: The port number to connect to on the remote server (the default port number is 3306). Enter keywords for templates that you wish to hide from the template editor accessible via the Theme Management page. For example, templates that are no longer in use, but you do not wish to delete from the server. Run scheduled tasks externally? means to use the server's own cron scheduler for automated tasks, rather than the scheduler included in Newscoop. 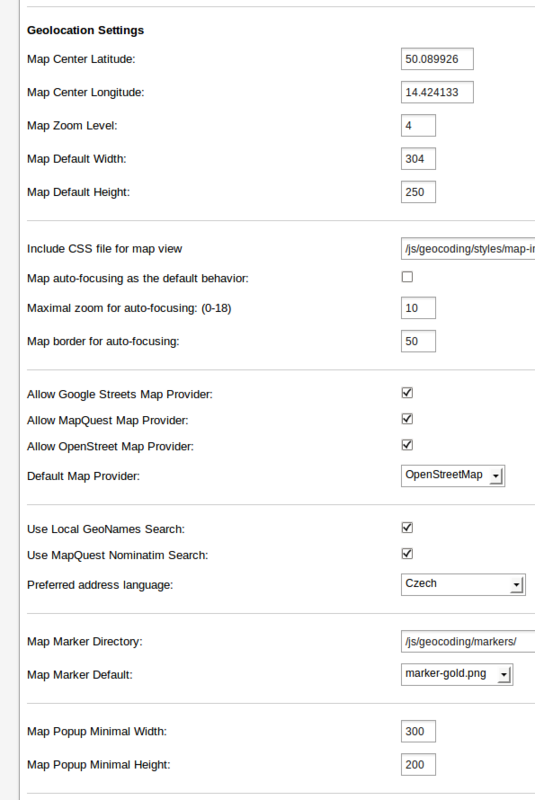 This section enables you to specify how maps linked to articles will be displayed, and which Internet mapping service will provide the data. 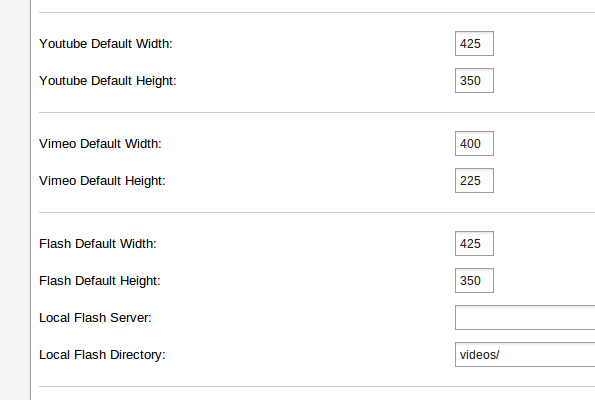 The default width and height of both externally and locally hosted video files can be set in this section, to make sure that the videos are displayed correctly in your publication's page templates. These settings are for integration of Newscoop with the MailChimp.com mailing list service. These settings are for integration of Newscoop with the Facebook API. Finally, the Save button updates your preferences.